SharesVault team is meeting with many companies for getting them registered on SharesVault. Many of them are ready to come on SharesVault. No one said clear no for registration as almost every companies are looking for fund now a days – be it working capital or new project finance. Than why SharesVault doesn’t allow them all to come on board ? Companies might have 100+ Crore turnover but does that make it qualify for SharesVault registration? Answer is No. Turnover is not as important for SharesVault as it is for company. Reason is number only doesn’t justify potential, credibility, reputation and growth of a company. Majority of companies SharesVault met doesn’t pass through SharesVault due diligence process because of hiding some financial numbers in saving taxes. In saving taxes and bad accounting practices, companies are loosing it’s value which could be multiple of 3 – 4 or more depends on company’s growth, profit, PE multiple and EPS. Reason for such thing would be less awareness for company’s valuation. Family run businesses which are going to last forever and don’t want any exposure like public market or outside investors have such mentality of not disclosing profits. From the company’s point of view – recession, inflation, government expenditure for company’s industry, government policies, corruption etc are crucial parameters which forces company for bad practices. SharesVault has started advising companies in their growth stage/early stage or even when companies are partnership/proprietor firm. Good accounting practices will bring good investors for companies and also bring good growth. It’s not all about accounting practices only, there are other parameters like – share holding pattern, CA and CS consultation, Board of Directors, advisers. 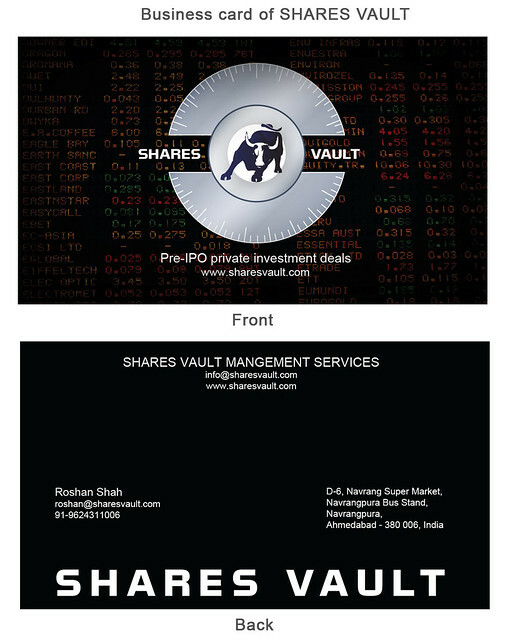 SharesVault provides advisory services for companies to be ready for public market. This takes time but in long run company’s value will be increased like anything. Like company having 100 Crore turnover has current share price of Rs.50 which is too less for such company can go up to Rs.200 or more if good accounting practice and corporate governance is followed. SharesVault make company follow good practices for the betterment of company and indirectly investors. How HUF can be benefited by investing in SharesVault ? SharesVault allows investor to register as HUF Karta. If investor has not registered as HUF than he/she can even apply for the same and get HUF PAN Card and bank account before registering on SharesVault. HUF or Hindu Undivided Family is defined under the Hindu Law as a family that consists of all persons lineally descended from a common ancestor, including wives and unmarried daughters. Any hindu individual male can create HUF as soon as he gets married to a hindu female. Its not necessary to have children to create HUF. If you have ancestral property and earning some income from this property, then it is better to transfer this asset to HUF and savetax up to exemption limit applicable to individual. The income from property of HUF can be further invested in instruments such as shares, mutual funds, etc. and will be assessed under HUF. In HUF there could be all the females’ members also when the husband dies and she has no sons. HUF also enjoys wealth tax exemptions available to individuals. Karta: KARTA is the father of the family who has the right to do all the things for the family and takes all the decisions on the behalf of the family. Co-Parceners: Coparcener is the person who has the right to demand the share of the property of family if he/she wants to part away with the family with his/her share. Member: Are the family members who dont have right to demand the share of the property. Investment through HUF has to be through HUF Bank Account and HUF PAN Card only. Income generated by returns on share transaction can be count as HUF income which will help in saving tax. Thus Sharesvault returns can also be helpful in decreasing tax. As it’s combine income and these asset will also get as inheritance to other family members. At SharesVault once investor has stocks, he/she can sell it through multiple options. Investor can be one who has purchased Shares from company, other investor or employee with ESOPs. Based on investor choice, investor can post sell request for his/her Shares. In this method Investor keeps fixed price and buyer who will agree to the price will accept it and shares will be sold to that particular buyer. Ex. Mr. Sharma has 10000 shares of ABC Pvt Ltd and he wants to sell on Rs.55 than he will post it and the one who agrees to buy will accept it. In this method Investor will post sell price but ready to negotiate if any buyer is interested in buying the share. Ex. Mr. Sharma has 10000 shares of ABC Pvt. Ltd and he posted to sell on Rs.55. One buyer is interested to buy the shares at Rs.54 and if both agree on prices than transaction process will be initiated. In this method Investor will post floor price which is minimum he/she expects and keep the bid open for certain time. Interested buyer will post. Buyer can see bid history and even the current highest price. Ex. Mr. Sharma has 10000 shares of ABC Pvt. Ltd and he posted to sell with floor price of Rs.54. Buyers started bidding with prices like 54.20, 55, 54.50, 55.20. At the end of auction transaction will be initiated between highest bid buyer and investor. These many options will help investor to create interest in company’s shares and also will keep investor on SharesVault interested to buy/sell more and this will bring liquidity in Pvt. 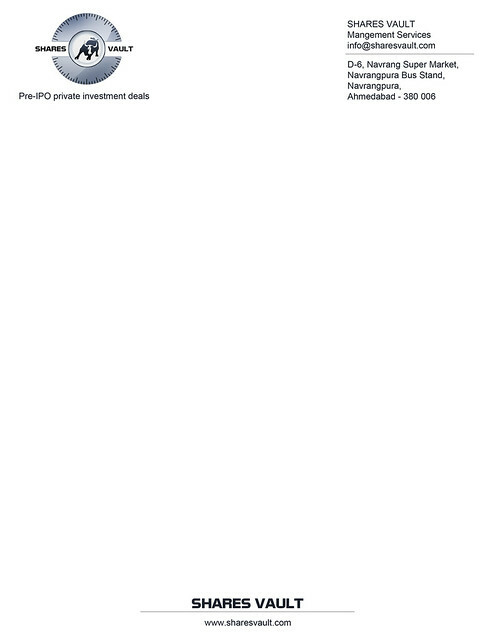 Ltd. Company shares. SharesVault is on fast track now since Bhaumik Vasavada has joined as full time Managing Co Founder. Last weekend – (14th and 15th July,2012) SharesVault team spend their time at IIM, Ahmadabad. Team has attended YourStory.in event – TechSparks 2012. Very fruitful Panel discussion was there on how to pitch VCs and how to scale up. Mr.Aakash Goel from Sequoia Capital was quite impressed with SharesVault concept and shown his interest to see demo of it. Now SharesVault is pitching Sequoia for further round of talks. Team also met Shradha Sharma, Founder of YourStory.in and decided to meet Sunday Early morning at 6:30 AM. She thought we might not come at such weird time and that on Sunday but we did !! Roshan, Rushik and Bhaumik met Shradha at 6:30 AM and she was very amazed to see as we all had less than 5 hour sleep previous night. Discussion started for tie up with YourStory.in and it went till 2 hours. Various topics were discussed from he Times of India, CNBC experience to how Gujjus are very much possessive about their equity in company. We had verbal deal to help each other which Shradha and we both have fulfilled in less than a week by helping each other in their work areas. Overall it was a great weekend for SharesVault and it’s team to get feedback of various people on SharesVault !! EDI Empresario 2012 event was a very big platform for any start up company to show their concept to cream people. SharesVault grabbed this opportunity and setup a stall and interacted with many people which include students, professors, diplomats, CEOs and entrepreneurs. Many Questions were asked regarding our business model, concept and legality. All were answered by Bhaumik Vasavada and Ankur Patel at SharesVault stall. Many companies CEO and other entrepreneurs shown their interest to list their companies on SharesVault platform. Experience got through this event really helped Bhaumik Vasavada , than Coordinator now one of the Co Founder, to showcase SharesVault in front of big crowd and learn many aspects of marketing and public speaking. Rushik Shah is the CEO & MD of Alakmalak Technologies Pvt. Ltd, which deals with website development solutions, which is one of the regions’ leading firms. Mr. Rushik also owns and manages a Local Job portal of Gujarat, called Gujarat.com which is currently among the top 5 job portals in terms of database in Gujarat. A Graduate of Gujarat University in Engineering, also holds a Master degree in IT Management from Illinois Institute of Technology, USA. He is one of the few individuals who have returned back to India after completing education overseas. Looking at the immense potential India has this days to erupt as a major super power. He also is a active member of Gujarat Startups which was founded by Mr. Roshan one of the Co-founders of Sharesvault, which revolves around setting up a base for startups in Gujarat.